December 27th American Corner has arranged a seminar about Meditation for Mrs. Shreya Ozkaya. In this seminar she mentioned the benefits of meditation for human body and how this practice will lead you happier and more focused in your life. At the end, she practiced a few minutes meditation with the audience. New Year 2017 it is the time when we say good bye to the year 2016 and learn from the mistakes we did and strive to improve ourselves and take ourselves towards a more enriched life in all aspects of life. Let us all welcome the New Year 2017 with open hearts and far deeper commitments to our dreams. On 22th November 2016, American corner Sulaimaniyah arranged a seminar for Dr.Azad Hama, PhD holder at Philosophy, about "Disagreement" the topic has been explained in philosophy perspective then discussed with participants. November 21st 2016 was our English Club's last day. This English Club was leaded by our Amazing Volunteer Ms. Roza Ardalan, she is one of our outstanding volunteers in Corner whom willing to share her knowledge voluntarily with everyone. American Corner thank and appreciate her time and efforts during these two months, we are honored to have such a young lady in our community. 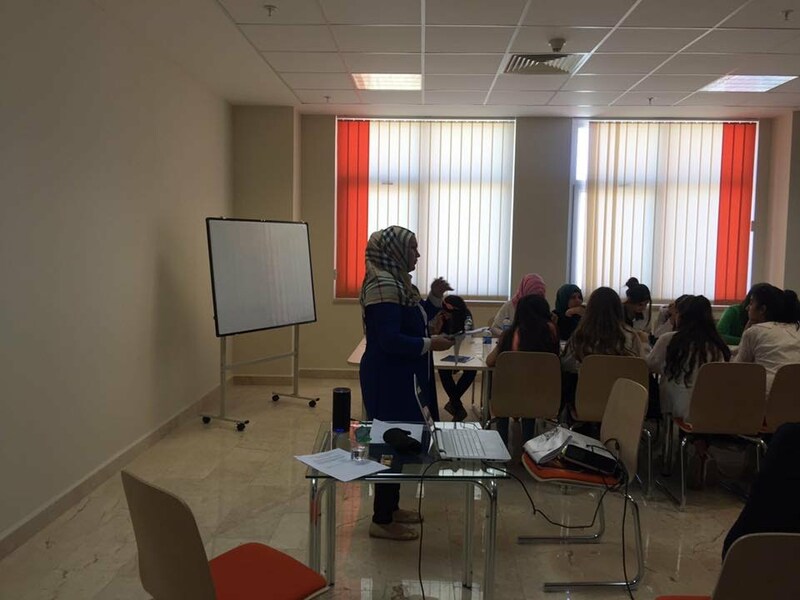 The last day of this event went very well, Ms. Roza cooperated with her fellows at American corner to make the last day more productive and unforgettable. We never forget to give a special thanks to our energetic Volunteers for their amazing performance during this class, and wishing the best to our students. On 21th November 2016, American Corner Sulaimaniyah arranged two semninars about Education USA with the Educational advisor at US consulate general,Erbil. 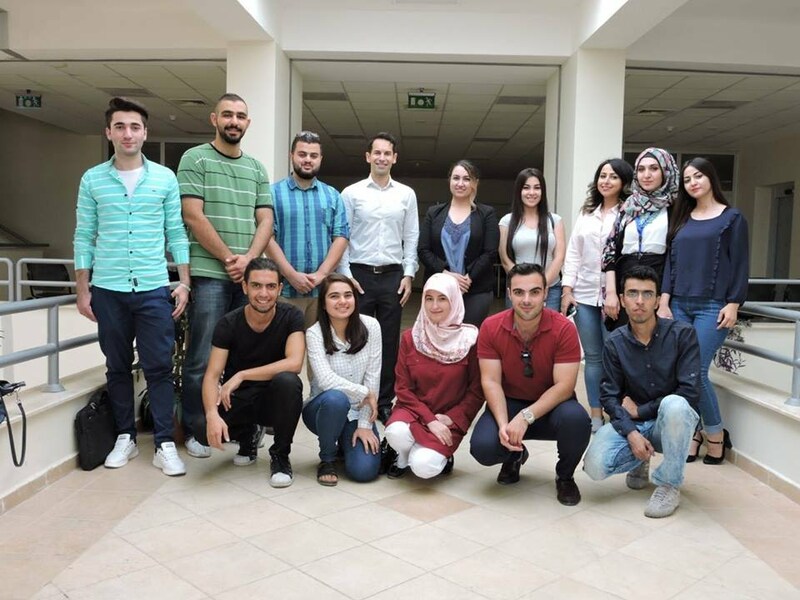 The first event has been held at American Corner Sulaimaniyah and then later at Cihan University. President of Cihan Universty gave an appriciation present to the Director of American Corner Sulaimaniyah, Ms.Zhala M.Noori for all of her great efforts. * Some basic Principles of Netiquette? On November 14th,15th and 16th Exchange Programs Alumni Organization for Community Development (EPA Organization) implemented Empowering Women to Become leaders at the American Corner. The project was 3 days long and focused on all the aspects of women empowerment, mainly focusing on the following topics. 1- The legal work frame of Gender Equality and Women's right in Kurdistan Region. 2- Gender Equality and challenges facing women in middle eastern communities and around the world. 4- Role of women in media and social activities. All the topics above were backed up with advice and support on how women over come these challenges and become successful women at hone and outside. The project was women lead, designed by Hezha Khan, president of EPA Organization, Zhala Project Manager and American corner's director , With young female volunteers as staff. پڕۆژەكە لە لایەن خانمانەوە بەڕێوە برا ، خاتو هێژا خاوەنی بیرۆكە و سەرۆكی ڕێكخراوی (ئی.پی.ئەی) وە خاتوو ژاڵە بەڕێوبەری پڕۆژە و بەڕێوبەری گۆشەی ئەمریكی سلێمانی ستافێك لە كچانی خۆبەخش لە گۆشەی ئەمریكی سلێمانی. گۆشەی ئەمریكی سلێمانی لە (15-11-2016) سیمینارێكی ڕێكخست بۆ ڕاوێژكاری خوێندن لە ئەمریكا" لە قونسولخانەی گشتی ئەمریكا لە هەوڵێر. سیمینارەكە بە ئامادەبوونی د.ئالان سەرۆكی زانكۆی پۆلی تەكنیكی سلێمانی ، د.حەكیم ڕزگار و هاوبیر حمە علی یاریدەدەری بەڕێوبەری گۆشەی ئەمریكی سلێمانی لە سەرۆكایەتی زانكۆی پۆلی تەكنیكی سلێمانی بەڕێوە چوو. تێیدا باس لە ئۆفەر و ڕێگاكانی خوێندن لە ئەمریكا كرا و ڕێگاكانی كار ئاسانی بۆ بەشداربوون خرانە ڕوو. November 13th 2016 An exclusive Workshop for American Corners' Volunteers. "How to become a successful Volunteer" by Mr.Swren Abubaker a sociologist and university Instructor. لە 13ی نۆڤەمبەری 2016 ، گۆشەی ئەمریكی سلێمانی ۆركشۆپێكی ڕێكخست بۆ خۆبەخشەكانی گۆشەی ئەمریكی لە ژێر ناونیشانی "چۆن ببیت بە خۆبەخشێكی سەركەوتوو" كە لە لایەن بەڕێز ماموستا سورين ابوبكر مامۆستای كۆمەڵناس له زانكۆی سلێمانی. English club at American corner Sulaimaniyah is one of its services to help people improve their English language. Ms. Roza Ardalan; is a leader of current English club at American corner Sulaimaniyah. She helps club members by explaining grammar, doing activities and providing an English environment for them. 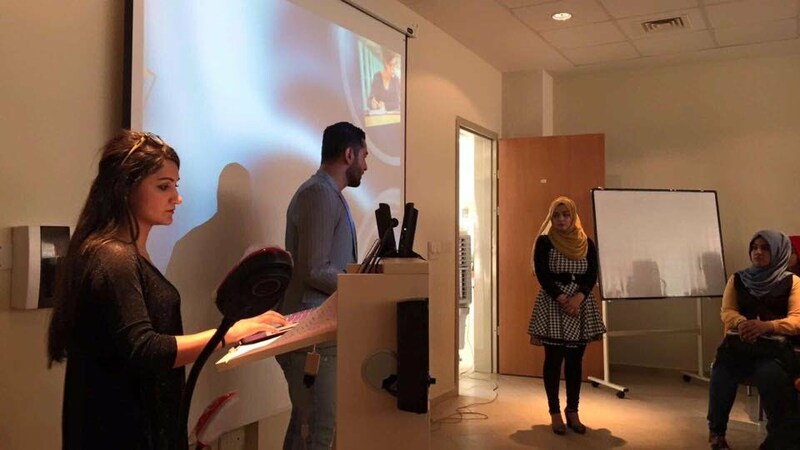 Ms. Shan has presented a seminar about Iraqi Youth Leadership Exchang Program, at American corner Sulaimaniyah, the seminar explained IYLEP application preocess and the eligibility and requirements to participate in this exchange program. Giving completion certificates to our club participants at American Corner Sulaimaniyah was another achievement for this beautiful family. This event gathered All of participants, volunteers and US consulate general staff, everyone enjoyed their time together, we are looking forward to see new generations to our clubs. پیدانی بڕوانامە بە بشداربوانی بانەكانی گۆشەی ئەمریكی سلێمانی دەستكەوتێكی تری ئەم خیزانە جوانەیە. دوێنی ئاهنگی بڕوانامەكان بوە هۆی كۆكردنەوەی هەموو بەشداربوان و خۆبەخشەكانی گۆشەی ئەمریكی و لەگەل ستافی قوسولگەری گشتی ئەمریكی لە هەولێر، هەموومان كاتێكی خۆشمان بەسەربرد! بە تامەزرۆییەوە چاوەڕوانی نەوی نوێی یانەكانمان دەبین بەم زوانە. (11-10-2016) گۆشەی ئەمریكی سلێمانی ئا هنگێكی گەورەی سازكرد بە ئامادەبونی بەڕێز دلێر شارەزا لە ئاڵوگۆڕی كەلتوری، و خاتو زوڵەیخا یاریدەدەری سیاسی قونسولگەری ئەمریكی لە سلێمانی و ڕێڤین مزوری ڕاوێژكاری خوێندنی ئەمریكی، بە مەبەستی پێدانی بڕوانامە بە بشداربوانی یانەكانی (قسەكردن، نوسین ، خوێندنەوە)، هاوكات لە لایەن بەڕێوبەری گۆشەی ئەمریكی و یاریدەدەرەكەی بڕوانامە بەخشرایە مامۆستای یانەكان و خەڵاتی وەفاداریش بەخشرابە خۆبەخشەكانی گۆشەی ئەمریكی سلێمانی. American corner in Sulaimaniyah, today has started its first class of English club in Kalar city. The First class of this English Club started with introducing American corner, followed by an Ice Breaking bingo game. We were very happy to meet these all smart students that made a very good conversation in their first class. 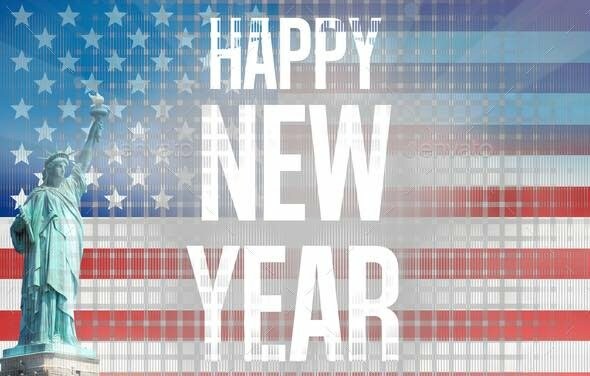 We as American Corner's Staff wishing you all the success. (10-05-2016) American corner in Sulaimaniyah hosted a seminar and workshop for Rebeen Pasha, leader of MyeDream group, They covered many important points about entrepreneurship and business. (10-05-2016) گۆشەی ئەمریكی سلێمانی ، سیمینارێك و ۆركشۆپێكی سازدا بۆ بە ڕێز ڕێبین پاشا بەڕێوبەری گروپی مایی دریم (MyeDream)، كەتێیدا چەندین بابەتی گرنگ لەسەر ئیدارەدانی كار و كاری سەربەخۆ باسكران. 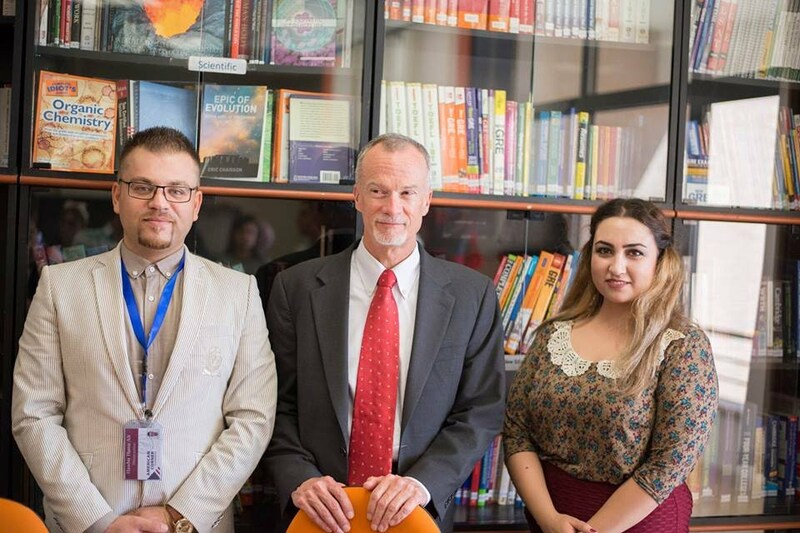 (Sep-08-2016) a staff from American consulate genera Erbil, which is consist of new consulate Mr.Ken Gross and Doug Morrow public Affair of the consulate have visited American corner in Sulaymaniah so as to introduce Ken Gross to the American corner. 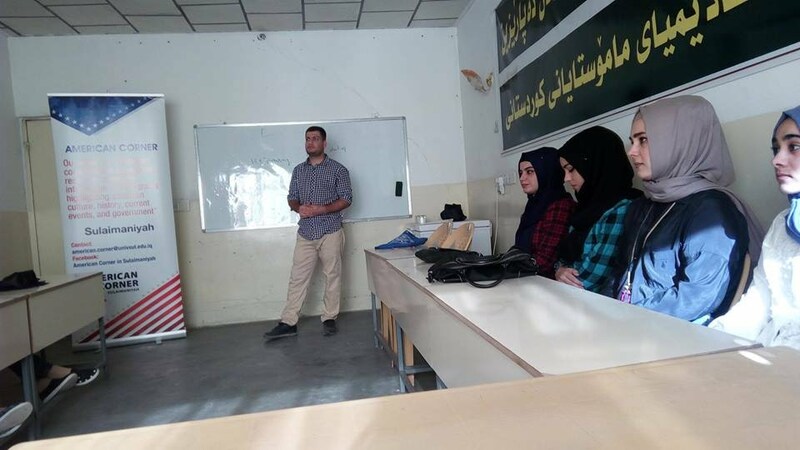 Our volunteers started to introduce American corner to the new consulate with an activity, then the directoer of American corner in Sulaymaniah has presented an intensive presnetation about our works and projects. In the past two month, American corner in Sulymaniyah made some English clubs to help those people who wanted to learn English language. We had clubs of English speaking, English writing and English reading, in which more than 150 persons got benefit. American corner in Sulaymaniah is one of the USA programs to education and cultural exchange, which is located at University of Sulaymaniah, new campus-central library. The day one of this workshop has been leaded by Mr. Arsto Ahmed one of American Private Center's teachers and UOS instructor who presented his first topic about CRITICAL THINKING. This course is an online course which run by a group of volunteers with American corner’s help in Sulaimaniyah. This online course has a blended learning style include both online and classroom illustration. 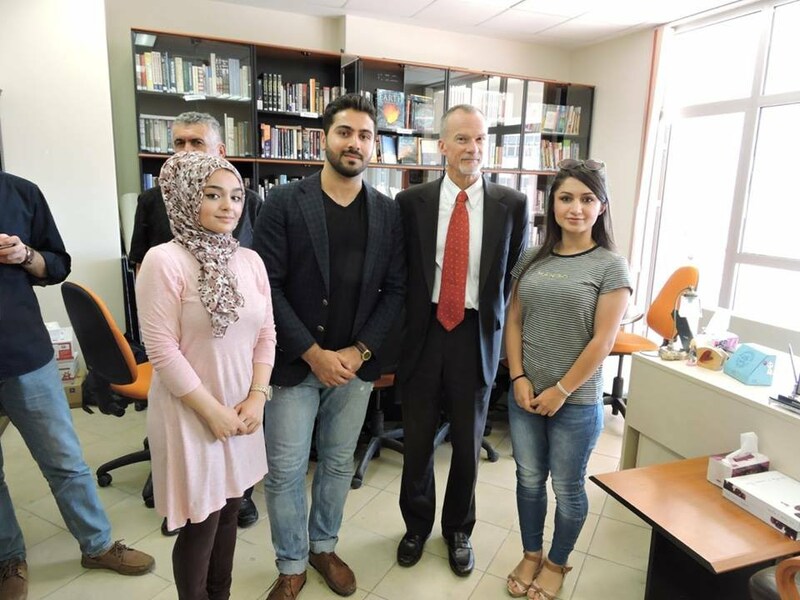 Kurdistan Save the Children visited American corner in Sulaymaniah by request of American corncer to setup charity box for our beautiful children. سەردانی منداڵ پارێزی كوردستان بۆ گۆشەی ئەمریكی سلێمانی لەسەر داوای گۆشەی ئەمریكی ، بە مەبەستی دانانی سندوقی هاوكری بۆ منداڵە جوانەكانی كوردستان لە گۆشەی ئەمریكی. 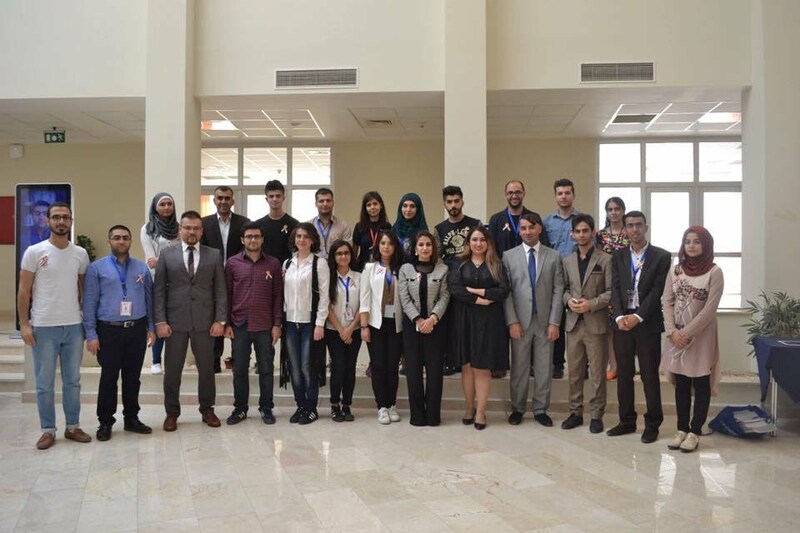 Seminar was about "Kurdistan online education project"
American Corner had invited the Toastmaster- public speakers staff to university of Sulaimani, as it was a good chance to introduce themselves and how other people can be a member in their organization..
- While wrapping up! Volunteering soul is always exist. One of American Corner's Activity is Book Club. A book discussion club is a group of people who meet to discuss a book or books that they have read and express their opinions, likes, dislikes, etc. It is more often called simply a book club, a term that is also used to describe a book sales club, which can cause confusion.